 There are 2 alerts for this place. This alpine park straddles the Main Divide of the Southern Alps, with dry beech forests in the east and damp podocarp forests to the west. While lacking the international icon tracks, Arthur's Pass is a popular park with local trampers, offering a good network of tracks and huts, many maintained to only basic standards, plus some classic and challenging routes. Carroll Memorial Hut • By ledge. Arthur's Pass National Park was the first to be established in the South Island. 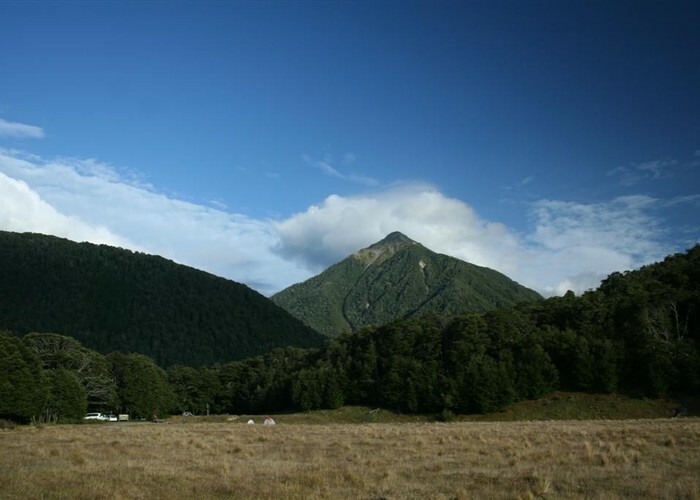 It lies along the highway that connects Christchurch in the east with Greymouth and Hokitika to the west, with the convenient Arthur's Pass Village just walking distance from the pass itself. The route opened in 1866 as coaches began servicing the West Coast goldfields. The rail link opened in 1923 with the completion of the Otira Tunnel which passes under the pass. Many tunnel workers' huts still remain in the villages of Arthur's Pass and Otira today. Arthur's Pass village just south of the pass offers food, petrol, and accommodation. A good selection of both easy and challenging day walks start right from the village. 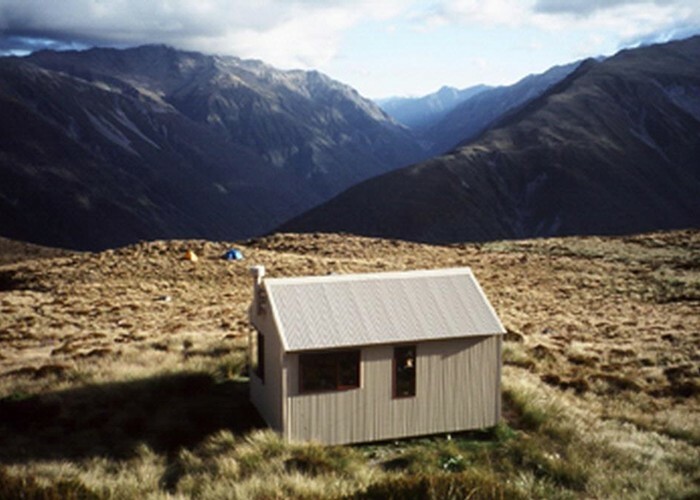 Hut tickets, information, and mountain radios are available at the Arthur's Pass Visitor Centre. Take the Arthur's Pass Walking Track from the village to the pass, then explore the Dobson Nature Walk. Devil's Punchbowl Waterfall (112m) is a good walk from the village. 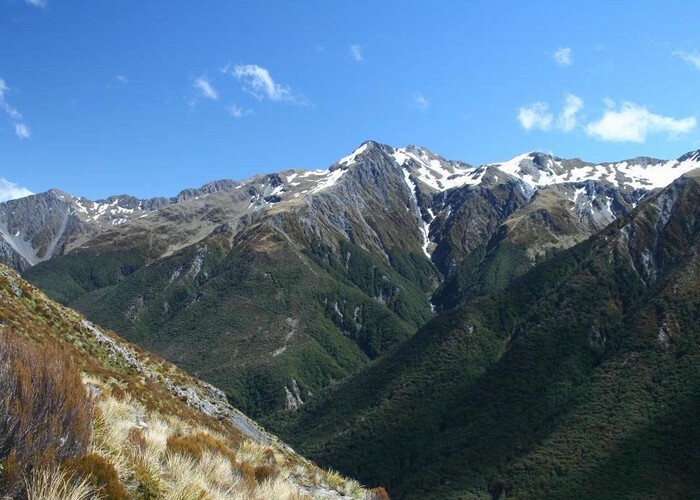 Avalanche Peak (1833m) is the classic challenging day walk from Arthur's Pass Village. Spot blue ducks / whio on the Goat Pass Track. Camp on the wide golden flats at the Hawdon Shelter. Arthur's Pass Village is 2 hours from Christchurch by SH73, and 1 hour 10 minutes from Hokitika or Greymouth by SH6 and SH73. Busses do run through the park, and can pick up or drop off along the way. The TranzAlpine Train runs through the park and can pick up or drop off at the village. The Mount White Road turns off SH73 just north of Cass, and provides access to the Hawdon, Andrews, and Poulter Valleys. Hawdon River flats • By Matthew. All campsites have toilets and cooking shelters. Backpackers' hostels, motel units, and rental holiday homes are all available in the village. The Old Coach Road forest walk near Greyneys Shelter is suitable (but challenging) for wheelchairs. Entrance fee: there are no fees for New Zealand national parks. Pets: dogs and pets are not allowed in the national park, although they are allowed on lead in the village. Kiwi are present in the area. 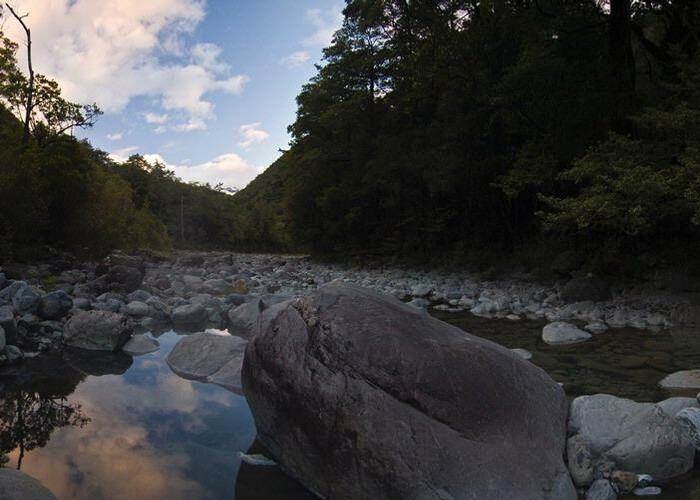 Vehicles: 2WD vehicles and mountain bikes may cross the Mount White Bridge to explore the eastern fringes of the park as far as the Poulter River. From here, mountain biking into the park as far as Trust / Poulter Hut is allowed. Mountain bikes are prohibited elsewhere in the park. Otehake Hot Springs • By SINthetyc. Many tracks are subject to avalanche hazards in winter. Check at the visitor centre. Many routes are unmarked, requiring high levels of experience and fitness. Many routes in the park are exposed to alpine conditions, including several short walks. Warm and waterproof clothing must be carried. Added 3 February 2006 by MatthewMatthew. 10 revisions, most recently 4 September 2014 by MatthewMatthew. 271 views in the past year (23 per month).